These avocado chocolate mousse parfaits with graham cracker crust is what you need for some guilt-free indulgence. It’s made with a total of 7 ingredients only! Thank you Pamela’s Products for sponsoring this post! For the longest time, I had been skeptical of the avocado chocolate mousse. I mean, I love avocados and chocolate individually. Who doesn’t? But the whole idea about blending them together didn’t sound quite right. When I hear the word “avocado,” I think guacamole, tacos, toppings for kale salads—basically, foods that probably wouldn’t go well with chocolate. Do you see why I hesitated to embrace avocado chocolate mousses? It didn’t help that the first one I ever made last year ended up being a disaster. My chocolate to avocado ratio was all wrong and using agave to sweeten the mousse turned out to be the wrong move. 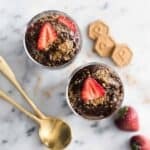 The entire thing tasted like imitation chocolate pudding, something that my husband quickly dubbed as another one of my “hippie healthy” recipes. I put the entire recipe in the back burner for a while before I decided to rework the recipe. I received a box of Pamela’s Gluten-Free Honey Grahams a few weeks ago, and I felt inspired to make a mousse with crushed graham crackers. Let me tell you, it definitely pays off to not give up on something! I LOVED the new recipe so much that I couldn’t stop eating the mousse! It was that good. Layering this chocolate mousse with graham crackers gave the entire dessert nice textural contrast. 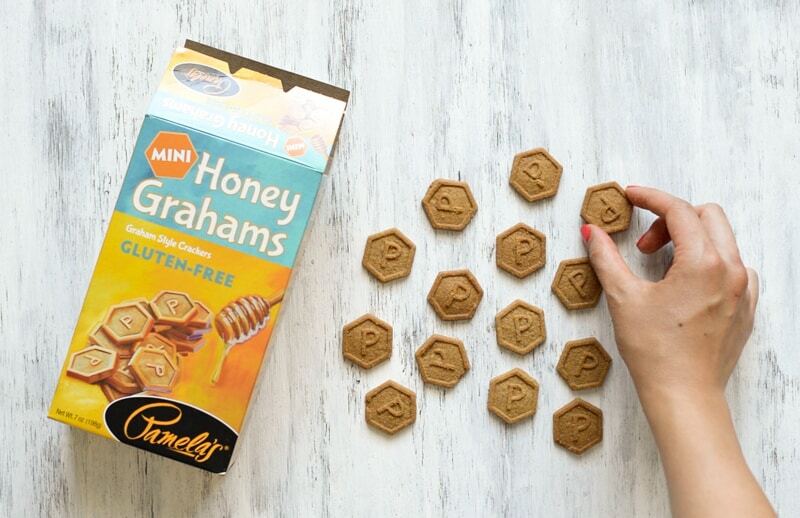 That’s where the Pamela’s mini honey grahams come in. I’m so excited to announce that I am an ambassador for Pamela’s Products this year! 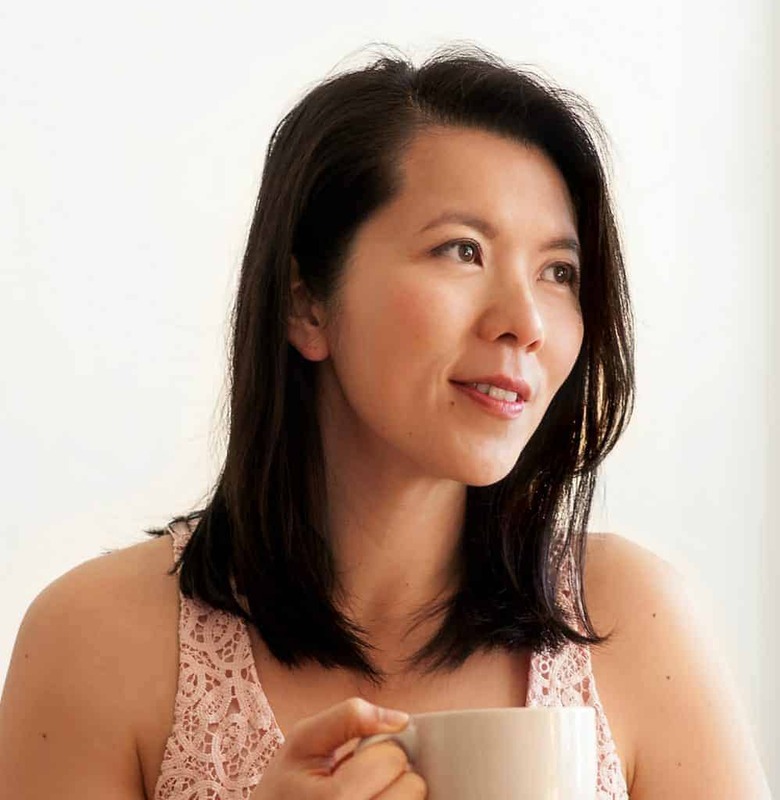 I’ll be partnering with Pamela’s throughout the remainder of the year to share several tasty gluten-free recipes. Pamela’s has an extensive line of gluten-free mixes and ready-to-eat treats, and I can’t wait to show you how you can cook with them at home! Using the right sweetener: Swapping the agave for maple syrup did the trick for me. The deep flavors of maple syrup pair very well with the cocoa powder. It made the mousse taste more like an actual chocolate mousse instead of an imitation chocolate mousse. Adjusting the sweetness to your liking: Because the honey grahams are already sweet, I used less maple syrup (6 tablespoons). If you want a mousse that is sweeter, add another tablespoon of maple syrup, but I wouldn’t add any more than that. Crushing the graham crackers: There’s no need to grind the graham crackers in a food processor. A rolling pin or even a glass works very well for crushing the graham crackers. 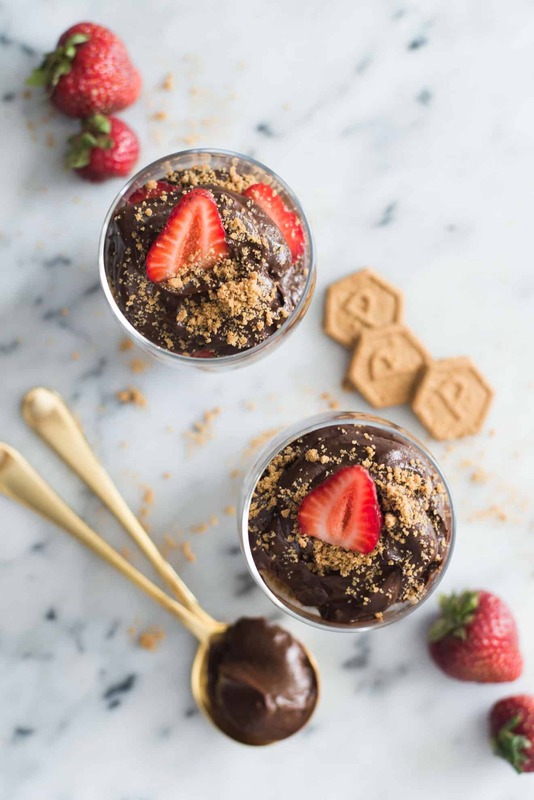 Serve parfaits immediately: The graham crackers will start to lose its crunchiness if you leave it with the chocolate parfait for over 30 minutes. To preserve the crunch, assemble parfaits right before serving. 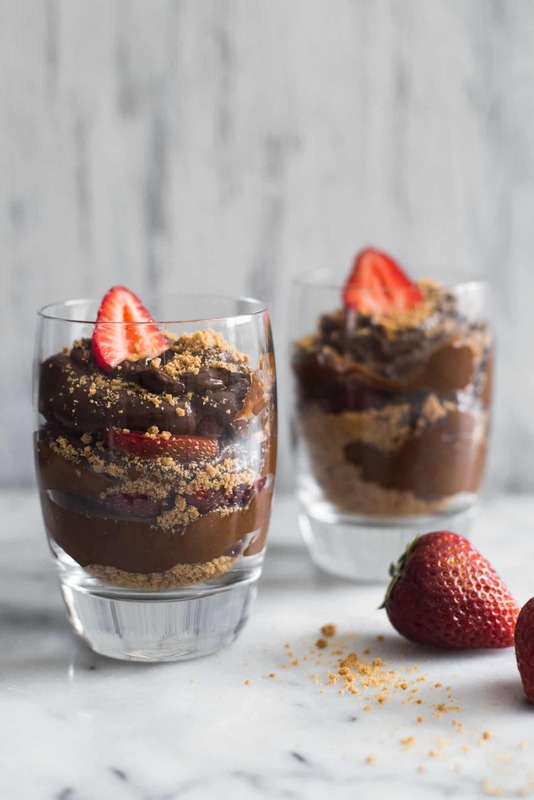 If you want to bring this mousse to a party or a picnic, pack the mousse, graham crackers, and strawberries separately and assemble parfaits when you’re ready to eat them. 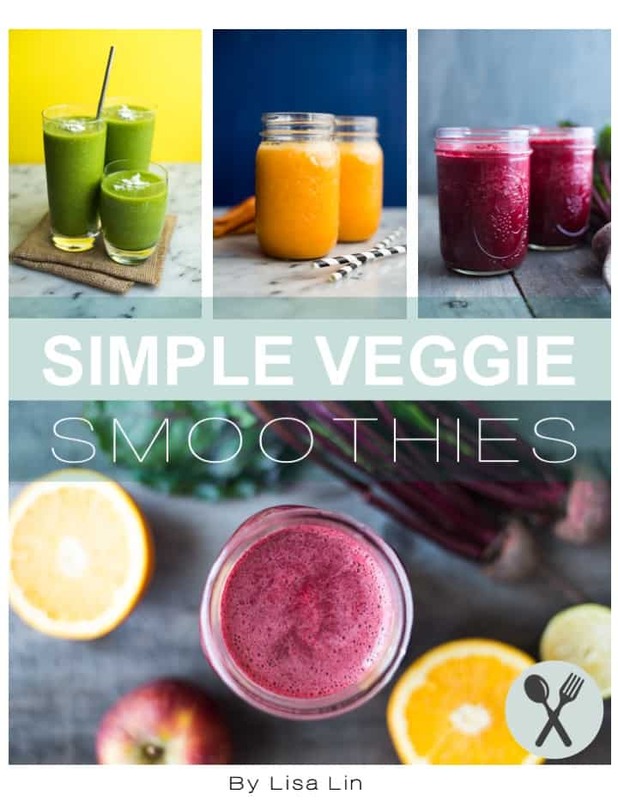 If you try this recipe, let me know how it goes by leaving a comment, sending me a message, or sharing a photo with me on Instagram! I love seeing your creations! Because the honey grahams are already sweet, I used less maple syrup (6 tablespoons). If you want a mousse that is sweeter, add another tablespoon of maple syrup, but I wouldn’t add any more than that. Cut open avocados in half and remove the pit. Scoop the flesh out of the avocado and add to a food processor. Add the cocoa powder, maple syrup, milk and vanilla extract. I used 6 tablespoons of maple syrup, but you can add another tablespoon if you want a sweeter mousse. Blend until smooth. Scoop mousse into a container and refrigerate for 30 minutes to an hour. The refrigeration helps thicken the mousse. Add mini grahams into a sandwich bag and seal it. Crush the graham crackers by using a rolling pin or a glass. Assemble the parfaits by adding 2 tablespoons of graham cracker crumbs into a cup. 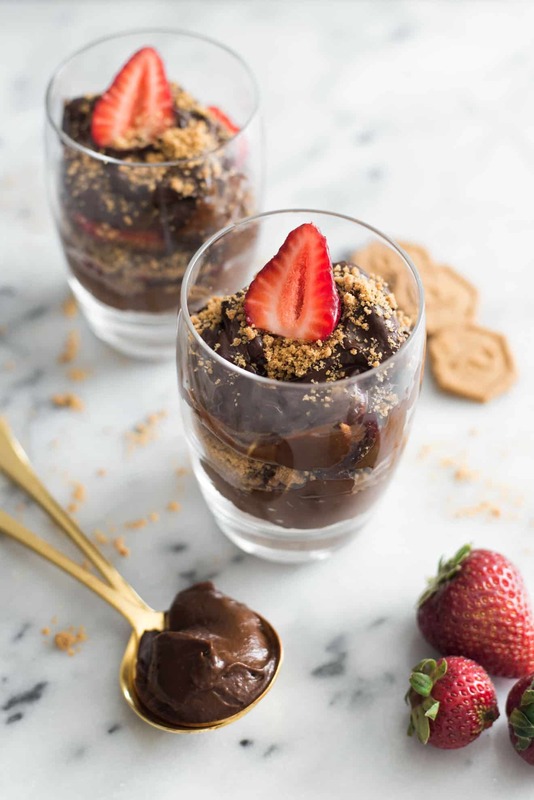 Alternate with layers of chocolate mousse, sliced strawberries and graham cracker crumbs to build the parfait. Serve immediately. Refrigerate leftovers for up to 2 days. I LOVE chocolate avocado mousse/pudding, and I’m sure the graham crackers only take it up a notch in both flavor and texture. Congrats on the ambassadorship! Strawberries, chocolate and avocado. 3 of my favorites! 🙂 Hope my end-product comes out as sweet as the pictures you took! But I very much doubt so. Do you think raw cacao powder would work here? Hi, Susan! I think so!